We don't often look at Amped Wireless products because Amped tends to be very late to market and we have found its products don't live up to their "unmatched Wi-Fi range and coverage" claims. But when Amped made a big deal about announcing its first AC1750 class router—the RTA1750—we decided to once again try to see if Amped brings something unique to the Wi-Fi party. 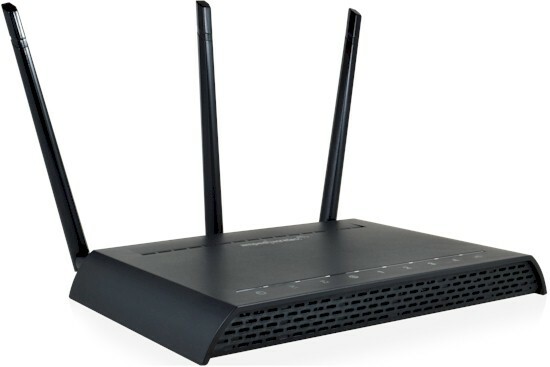 The Amped Wireless RTA1750 High Power AC1750 Wi-Fi Router is the new top of Amped's router lineup. Unlike many of its previous products, the RTA1750 is Qualcomm-based. As the diagram below shows, the RTA1750 has Amped's signature assortment of transmit power and receive low-noise amplifiers for each of its six 2.4 and 5 GHz radio chains (three chains each). The rear of the router has three RP-SMA antenna connectors, reset switch, WPS button, power connector, 4 Gigabit LAN ports and Gigabit WAN port. There is also a USB 2.0 port for storage sharing and main power and LED on / off switches. No Wi-Fi on/off switch, though. The front panel has indicator lights as shown in the callout graphic below. Note the panel markings are not white, but grey-on-grey that makes them hard to make out. LAN port indicators show link and activity, but don't change color to indicate link rate. The bottom of the router has plenty of vent slots, but the top has only one row at the rear of the top cover. The router is designed to sit flat on a desk or can be wall mounted either horizontally or vertically with centrally positioned four-way screw slots. The heart of the RTA1750 is a Qualcomm QCA9558 3x3 abgn WLAN SoC, which serves as the main processor and 2.4 GHz radio. A QCA9880 3x3 11ac radio handles 5 GHz band duties and there's a QCA8337 Gigabit switch that supports the single WAN and four switched LAN ports. We've seen the QCA9558/QCA9880 combo many times before, most notably in TP-LINK's Archer C7 V1 and V2, D-Link's DGL-5500 and most recently in Edimax' WAP1750 access point.